We are St Alban's Church of England Primary School in Havant, Hampshire, PO9 2JX. Our school grounds have been developed with both people and wildlife in mind. Beginning with a Wildlife Explorers Club (RSPB) about 10 years ago, we cut out a 2 metre circular bed and planted it with flowers to attract minibeasts. A single raised bed for vegetable growing followed and our gardening adventure began! We now grow a range of crops and have introduced a number of habitats and mini gardens in the grounds. A buddy system is often employed when we work in the garden, so that our older pupils support our younger children, passing on their gardening skills. A new front border has been installed by the children to make the entrance “more welcoming for pollinators and people”. This has been generating a great deal of horticultural interest and conversation and many visitors have commented on our planting. The bees also seem to approve, and we have spotted buff tailed, red tailed and early bumblebee species, as well as honeybees. The planning has been led and implemented by the children, supported by staff and volunteers. 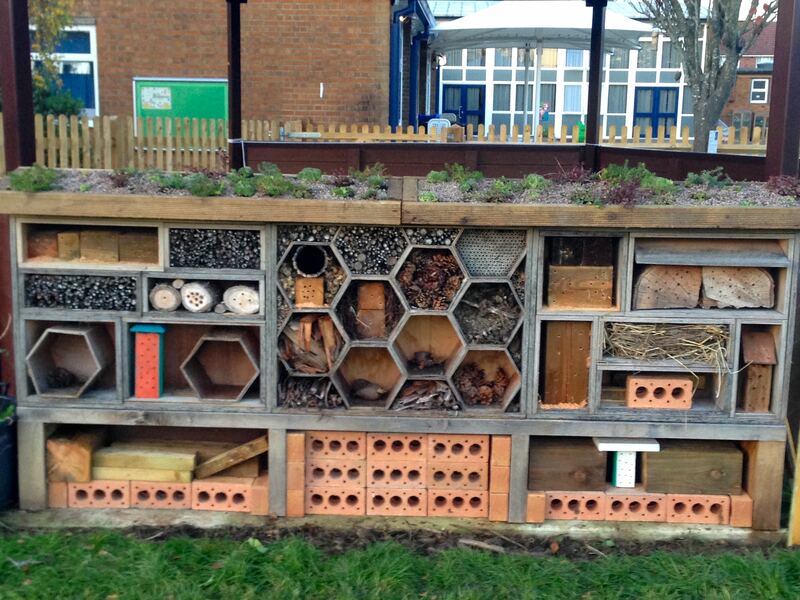 A dedicated team of pupil gardening enthusiasts came together to form "The Hive". Meeting outside of lesson time, they have 'gone the extra mile' to help wildlife and the environment, through gardening. 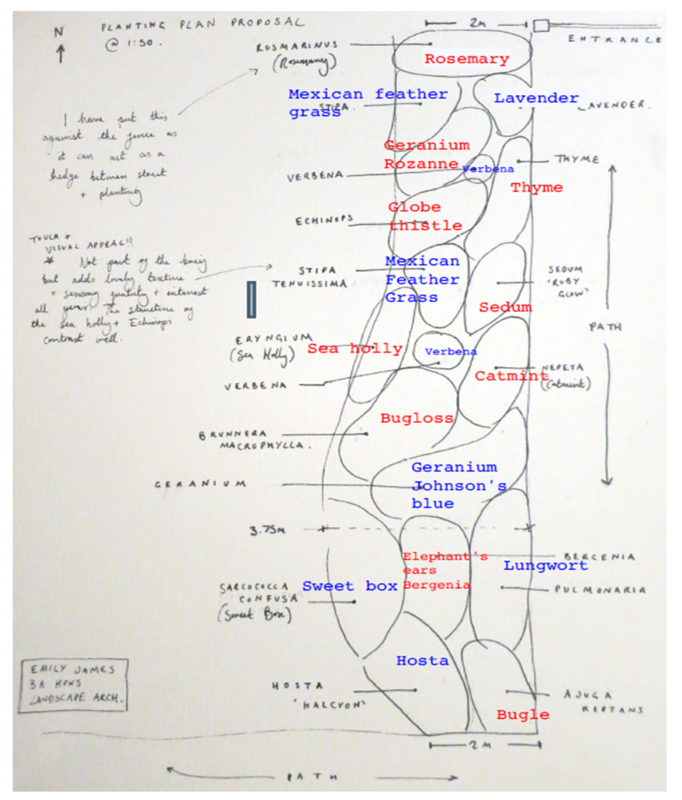 The team helped to draw up a design brief which was sent to former pupil and landscape architect, Emily James. Essentially, the brief was to provide nectar and pollen throughout the year, as well as being low maintenance. 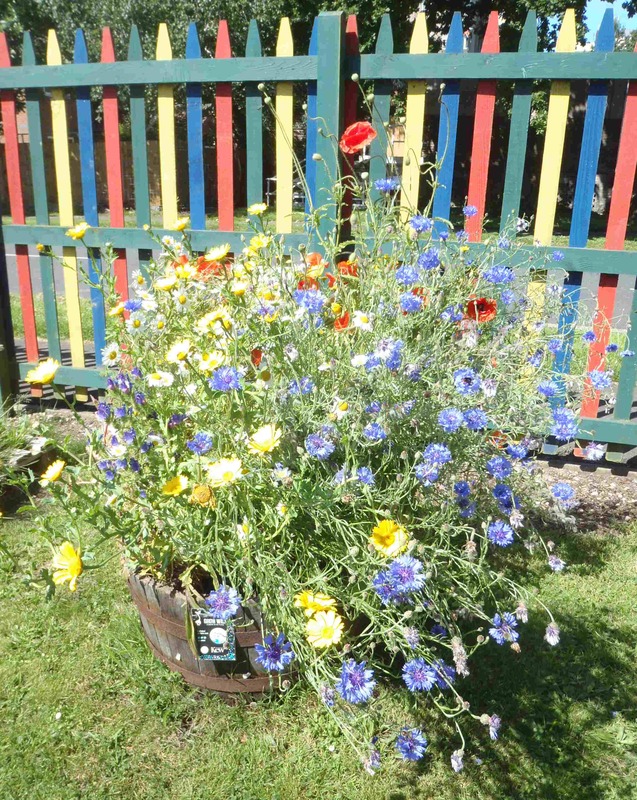 The Hive Gardeners took the design and added in some of their favourite pollinator friendly plants. Pupils helped to measure out the border, remove the turf and prepare the ground for planting during the autumn. In March, children from across the whole school dressed up as pollinators and worked to plant up the border during a Pollination Celebration day. They also sowed seed in pots, which were then planted out later in the season. They were supported by volunteers from the school and the local community. 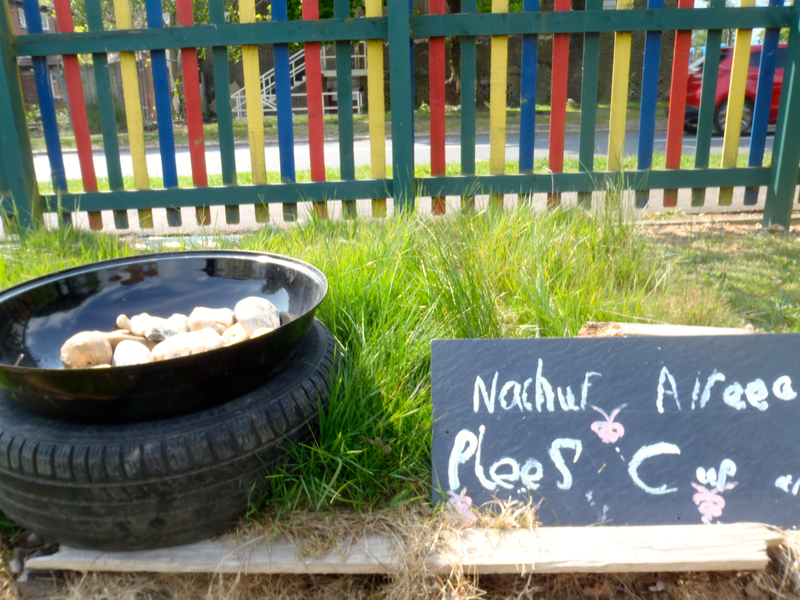 Our Reception Class, with the support of their buddies, have installed their own gardening area. This includes long grass areas, bug homes, pollinator friendly planting and areas to grow our own snacks! Last summer, we celebrated an end of year harvest with a Buddy Buffet of spinach, pea shoots, baby lettuce leaves, pea and rice salad and a cheese dip with herbs and edible flowers. We had not seen any solitary bee species in our grounds and our Garden Club decided to provide shelter and nesting habitats for them. 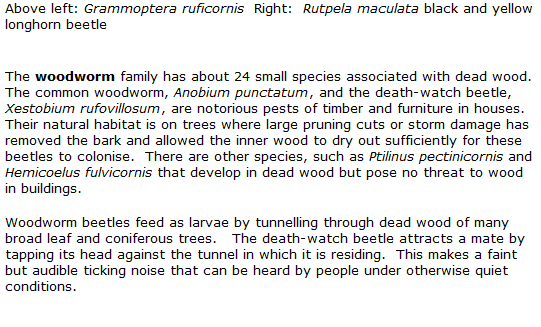 Children researched and generated design ideas for an insect hotel which were interpreted by a local company. 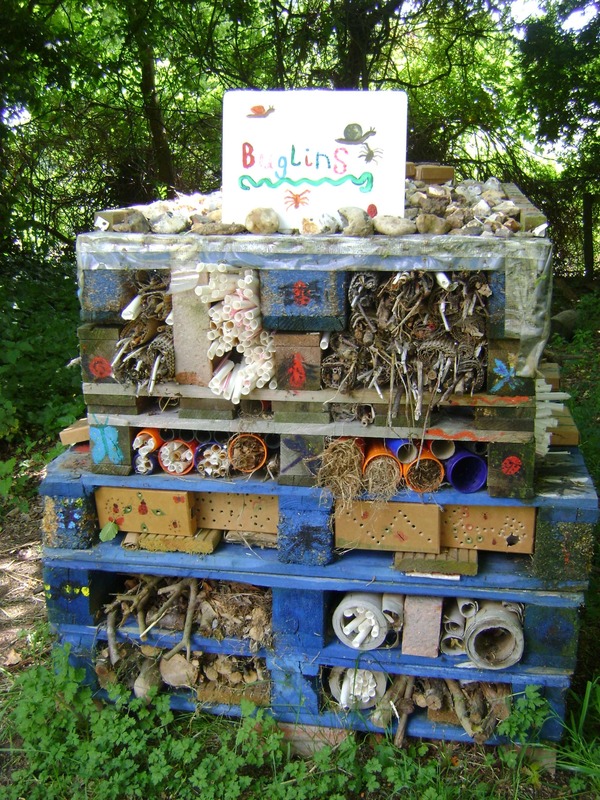 Materials collected from the grounds, such as teasel and sunflower stems were used by the children to fill nesting boxes. The filling of the wall is an ongoing process and we are experimenting with different materials for nesting and shelter. Children have also made bee houses at home and brought them into school, to become part of our bee wall. We are delighted that solitary bees began nesting within days of installing our insect hotel. When we discovered that froglets often rested on our playing field, we decided to let an area of the grass grow long. The area includes fruit trees, and we have begun to sow cleared patches with wildflowers to improve the habitat for pollinators. Like other gardeners, we find the increasingly erratic weather quite problematic! We also suffer from occasional vandalism but we work together to find creative solutions to new challenges, as they arise. Getting members of the community involved can be difficult but we are very grateful for the sustained support from our Wednesday afternoon volunteer team. Money is always a challenge in Education but we are supported by our Home School Association, who have seen how much the children enjoy and learn from outdoor learning in the grounds. Pupils help to raise funding for the garden through plant sales and other garden related materials and resourceful in their approach, they recycle where possible and grow nearly everything from seed. We all believe that if enough people make a small difference, great changes will follow. The understand the importance of pollinating insects and have persuaded people to promise to set aside a square metre patch or pot for pollinators. People signing up to the Pollinator Promise campaign have been given seeds harvested by the children and plants grown by them to start off their pollinator garden. So far, we have patches in home gardens and churches and have recently succeeded in getting local businesses and other schools on board. 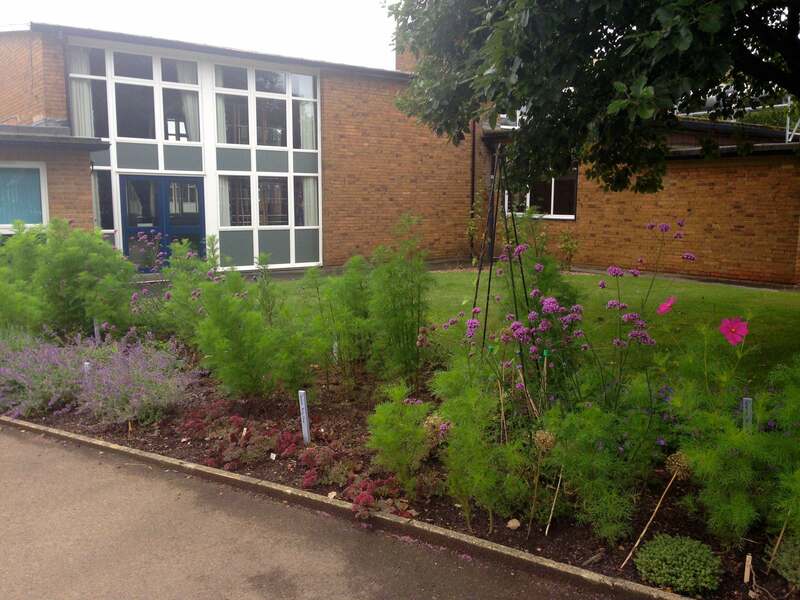 Following permission from Havant Council, we have also planted in local green spaces and the verge outside our school. Members of the Hive team continually come up with new ideas to share their love of gardening or to further improve the school grounds. All of the children are involved in gardening in some way but we hope to involve greater numbers of pupils in longer term projects to give them a full understanding of gardening and the natural world. We have been slowly regenerating our pond area and this is likely to be our next focus. We hope to continue to improve and extend the woodland planting and shelter habitat for amphibians and minibeasts. The Hive has made a mature and valid point that we need to look at the grounds, as a whole, once again. 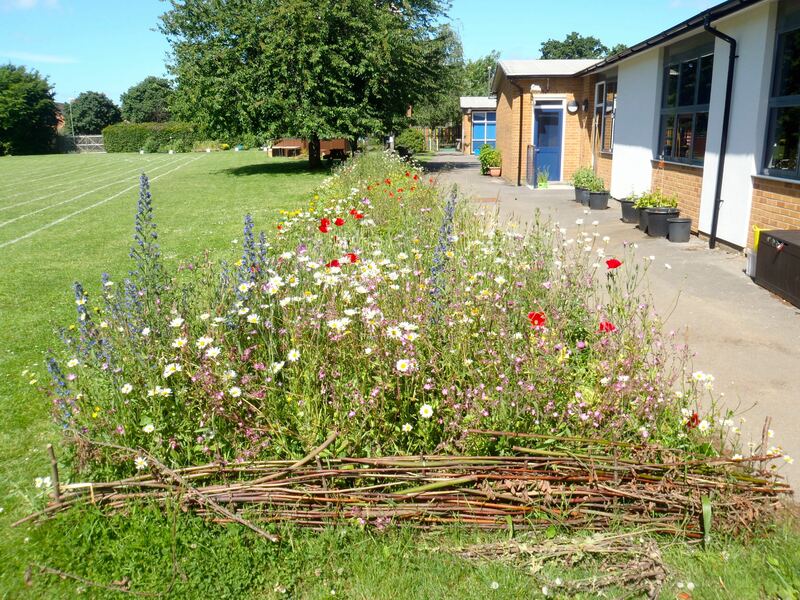 Much of our recent attention has focused on improving the front of the school and the Hivers understand that it is important to show that wildlife can benefit from such semi formal planting. However, they have politely pointed out that some of the grounds 'look a bit messy'. They feel that we should focus on maintenance and improving what we already have, rather than installing new features. They are keen to include some identification charts in the grounds, as well as some explanatory signage - "We know its important for wildlife but other people might just think it's messy." Trailblazer: A Hampshire County Council award scheme that promotes ‘learning to learn in the outdoors’. Polli:Nation: The Heritage Lottery funded Polli:Nation project has been developed by Learning through Landscapes in collaboration with other sector partners including The Field Studies Council, Buglife, Butterfly Conservation, OPAL Imperial College London, Stirling University, Bumblebee Conservation Trust and The Conservation Volunteers. Plantlife: Plantlife is a British conservation charity working nationally and internationally to save threatened wild flowers, plants and fungi. We are extremely grateful for the support this project received from Open Air Laboratories (OPAL) in setting up The Pollinator Promise web page. This has helped our children spread the message of the importance of pollinators and the ways in which they can be helped through gardening. 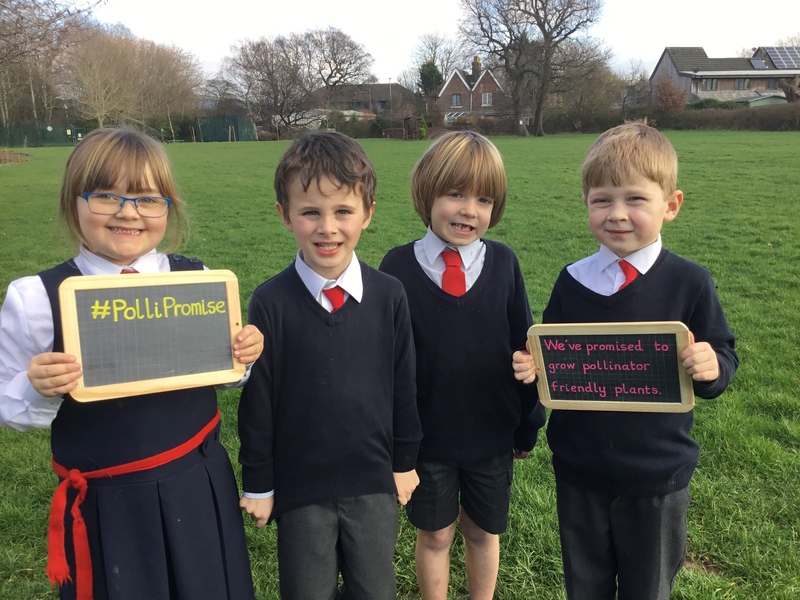 Having worked hard to provide food and shelter for pollinating insects on school grounds, the campaign aims to help all gardens play a role in assisting diminishing wildlife. Pollinator Promise helped St Alban’s CE Primary School win a Bees’ Needs Champions Award, presented in November at Kew Gardens by DEFRA Minister Lord Gardiner. Read more about this briliant achievement on our news page here. Since then we have presented to our local MP (Alan Mak), at the Worcestershire Pollinators Conference in March 2018, and at the Wildlife Gardening Forum's Wildlife Gardener's Day. You can imagine how proud the children are that their scheme has attracted so much interest and support nationally.